Couples will be much more confident about whether or not to pursue marriage after completing these in&#x2013;depth and personal questions. Norm also addresses the delicate subject of calling off the wedding if readers discover that a potential mate isn&#x2019;t actually meant to be a life partner. 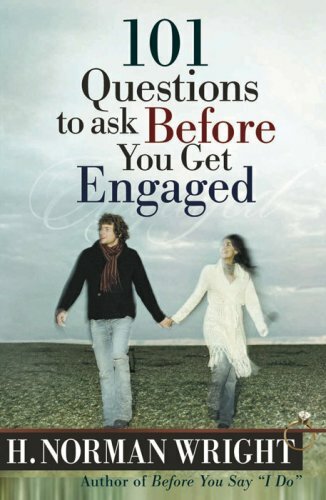 Many of the questions in this book are excellent tools for getting to know your significant other better, as you are contemplating marriage to that person. The introduction, however, is basically a list of reasons not to get married, with little balance on the other end. For instance, the author quotes Rachel Safier, who wrote a book about women who called off their weddings(There Goes the Bride: Making Up Your Mind, Calling it Off and Moving On ). Safier's book is really popular with women who want confirmation that they did or are doing the right thing in dissolving their relationships; it's pretty one-sided in that way, as are many relationship books. But for people who have a fear of commitment due to family history or other causes, all this does (and all Safier's book does) is provide them with additional reasons to avoid marriage and commitment. Basically, the idea is if you don't feel absolutely certain, then you should dissolve the relationship. He even says something to effect of, if I haven't scared you away by now, then congratulations! Maybe this is because so many couples get engaged when they are still newly infatuated with each other, and not as worried about or simply blinded to the other person's character, background, lifestyle, personality, habits, etc. Ironically, the author even addresses the fact that some readers may be afraid of commitment later in the book, and he suggests that answering some of the questions may prove helpful in diminishing those fears. But, he should have addressed when he mentioned the reasons to not move forward. It's called balance. Are there red flags in relationships? Absolutely. He discusses abuse and other potential warning signs that one should look out for. I find his commentary -- apart from that in the introduction-- allows for unique differences between couples/individuals. But occasionally, he writes in a way that suggests that there is only one right way to do something --praying together--for instance. That sort of thing could potentially lead someone to hold his/her partner up to an unfair/unrealistic or rigid standard. This book was shared by a couple considering engagement. Both said the questions were helpful and thought provoking, although simple enough to do 10 questions at a sitting. This book is a really great book for multiple reasons. Second, this book does exactly what you are expecting it to with the 101 questions. Every single question we've read has either started a very good conversation, enlightened us into how the other views something, or was something we've discussed at length before and if we hadn't would be an important topic to talk about. Now I suggested in the title that this book is for every couple and not just for ones thinking of getting engaged or married. It can be elightening to couples who are casually dating and want some interesting conversation topics, or couples who are getting ready to get engaged or married. Couples who are just dating will learn more about their significant other and see if it really is somebody they want to stay with. For couples who are getting engaged or married it can help work through alot of issues before the stress of being married is added into the mix. The authors have done an excellent job with the questions/topics in this book! We've talked about most of the questions in a round about way, but we've deceided to write (there's space, we assumed for writing) our answers in and many times there is a different point thrown in that we end up talking about the rest of the evening!